This weekend, Amanda and I headed down to the Grand Staircase – Escalante National Monument so that we could search out some rock art and ruins in the area. 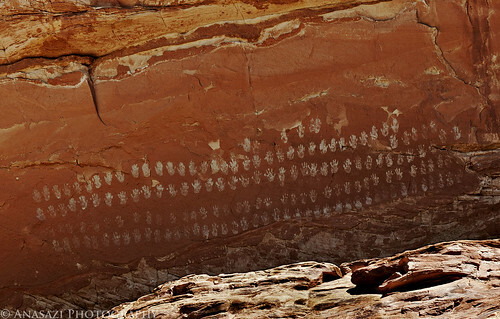 Our first stop yesterday was to visit the Hundred Handprints near the Escalante River. Unlike the last cave that I visited which claimed to have 100 handprints, this one actually delivers. This panel of many white handprints is located high up in a shallow alcove, which makes them very visible if you know where to look. The steep slickrock to to access this panel was much too steep for my climbing ability, even if I hadn’t been wearing sandals!